Alja-Safe™ Acrobat Product Information | Smooth-On, Inc. Specific Volume 26 cu. in./lb. Alja-Safe™ Acrobat™ is a fiber reinforced "non-sag" version of original Alja-Safe™ life casting alginate. Acrobat is thicker and holds vertical surfaces allowing the user better control for making molds of the face, torso, etc. 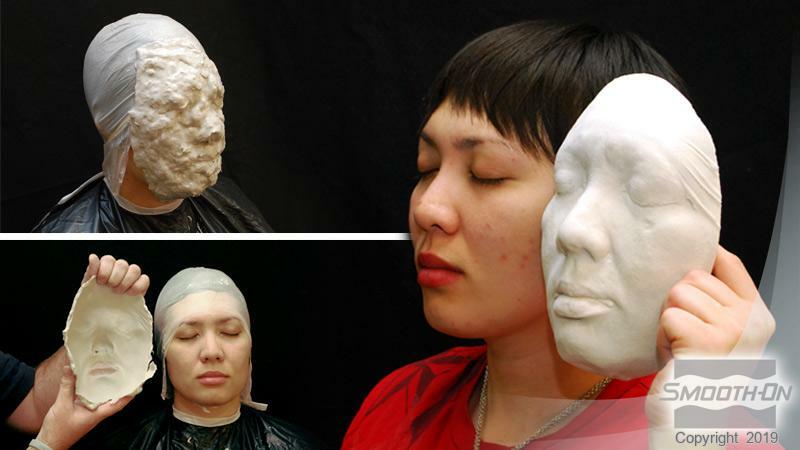 Acrobat™ reproduces perfect detail from all body surfaces and is good for making temporary molds that can be used to make highly detailed reproductions cast in wax, plaster, Matrix™ NEO™ (polymer modified gypsum), platinum cure silicone or Smooth-Cast™ 300Q ultra-fast urethane resin. Easy To Use – Mix ratio is 1 part Alja-Safe™ Acrobat™ powder sifted into 1 part water (1:1 by volume). Working time is 5 minutes and cure time is 8 minutes, assuming a water temperature of 80° F / 27° C.
Like original Alja-Safe™, Acrobat™ is skin safe and does not contain crystalline silica (a known carcinogen). 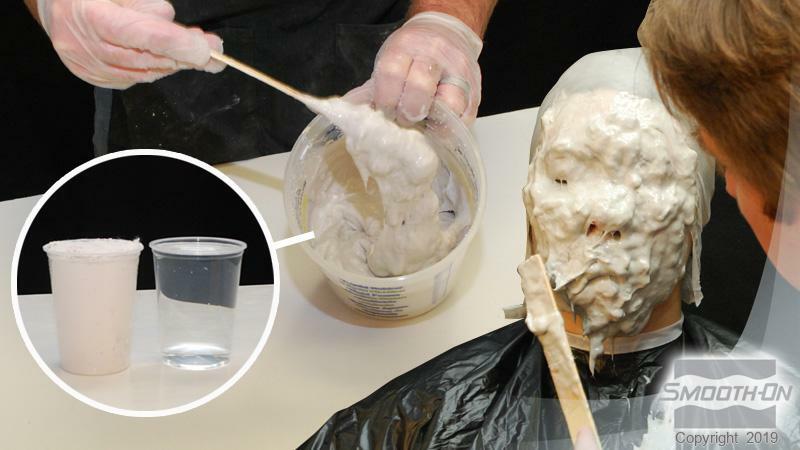 For making re-usable molds of any body part, use Body Double™ silicone rubber. IMPORTANT: This product has not been tested and should not be used for dental applications. Preparation - Store and use Alja-Safe™ Acrobat™ in a dry environment at room temperature. Alja-Safe™ Acrobat™ powder may get warm in storage/shipping during the summer months which will cause the powder/water mixture to set too fast. To remedy, store Alja-Safe™ Acrobat™ in a cool area (60°F - 70°F or 15°C - 31°C) for 24 hours before using. 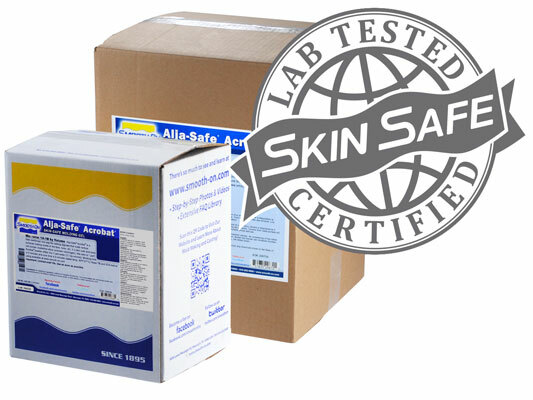 Alja-Safe™ Acrobat™ has a limited shelf life and should be used as soon as possible. Do not allow moisture to come into contact with unused Alja-Safe™ Acrobat™. Use only with adequate ventilation. 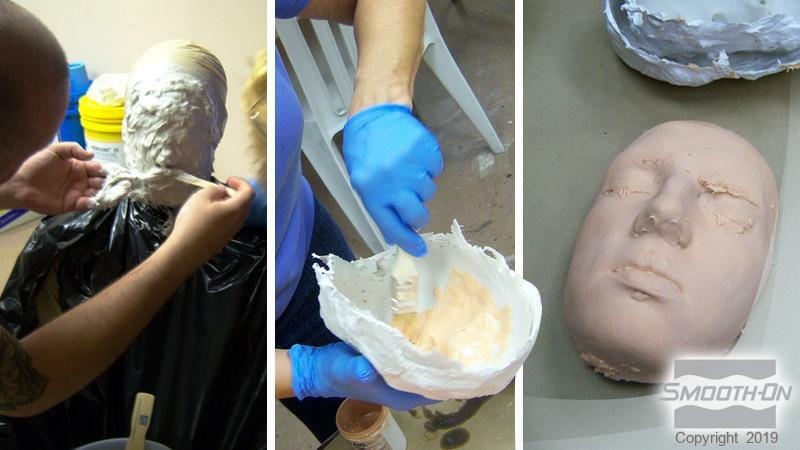 Practice: Make a mold of the back of your hand – make a mold of something small before going on to larger models. You’ll gain a lot of experience with a small test. Applying A Release Agent – Alja-Safe™ Acrobat™ will not stick to most surfaces. When making a mold of the head, a release preparation is recommended to prevent mechanical lock to the hair. Cholesterol based hair conditioner (available at most pharmacies) can be applied to hair-covered areas prior to applying Alja-Safe™ Acrobat™. It can be washed out of the hair easily after use. Measuring – Alja-Safe™ Acrobat™ is mixed 1 part water to 1 part powder by volume (1 cup + 1 cup, for example). IMPORTANT - You must pack the powder firmly into the measuring cup. You can vary the water level somewhat to change consistency of the mixture. Less water will make Alja-Safe™ Acrobat™ thicker. More water will make the mixture thinner. Be careful…too much water will may result in the mixture not curing. Water Quality – Water that has a high mineral content (calcium, phosphate, etc.) may cause any alginate to become "lumpy" or not set properly. A small-scale test is recommended prior to mixing large amounts. Temperature Of The Water - At 80° F / 27° C, Alja-Safe™ Acrobat™ will have a working time of 8 minutes and a demold time of 10 minutes. Warmer water will cause the material to cure faster (less working time). Colder water will give a longer working time and slower demold time. For best results, sift Alja-Safe™ powder into water and mix as directed. Mixing – Alja-Safe™ Acrobat™ can be hand mixed, but best results will be obtained using a power drill with a mixer attachment. Attach a Jiffy Mixer or Turbine Mixer to a power drill and mix for one minute (depending on volume) to a gel-like consistency – smooth without any powder lumps. Jiffy mixers are available at many hardware stores. Turbine Mixers will yield the best mix and are available from Smooth-On or your Smooth-On distributor. Alja-Safe™ Acrobat™ is designed to be applied to vertical surfaces. For Best Results: Wet the surface of the model’s skin before applying. Apply a thin coating of Alja-Safe™ Acrobat™ to the surface of the model by brushing, smoothing the material on by hand or using a plastic spatula. Keep your model still until the Alja-Safe™ Acrobat™ sets up. You will know the Alja-Safe™ Acrobat™ has set when it is firm and no longer gel-like. You may want to experiment with the amount of water added to Alja-Safe™ Acrobat™ to find a thicker consistency that is right for vertical surface application. For example, some customers mix 1 part water to 1.5 parts Alja-Safe™ Acrobat™. Applying A Support Shell - Once the material cures, a support shell will be necessary to support the Alja-Safe™ Acrobat™ mold. Gypsona brand medical grade plaster bandages are ideal for this purpose, and are available from Smooth-On or your Smooth-On distributor. Casting Into The Mold - All alginate molds will deteriorate quickly. It is recommended that you cast into the mold within 4 hours following demold. Materials commonly cast into alginates include Matrix NEO (polymer modified gypsum, available from Smooth-On), plaster, wax, clay and very fast urethane resins (such as Smooth-Cast™ 300Q). 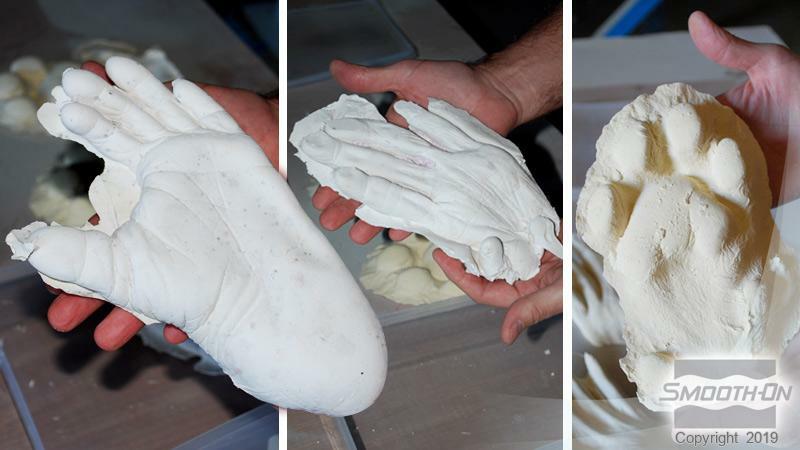 For Soft "Skin-Like" Castings – You can cast Dragon Skin™ FX Pro™ soft silicone rubber into Alja-Safe™ Acrobat™molds to make realistic hands, limbs, etc. Alja-Safe® Acrobat® is a fiber reinforced "non-sag" version of original Alja-Safe® life casting alginate.